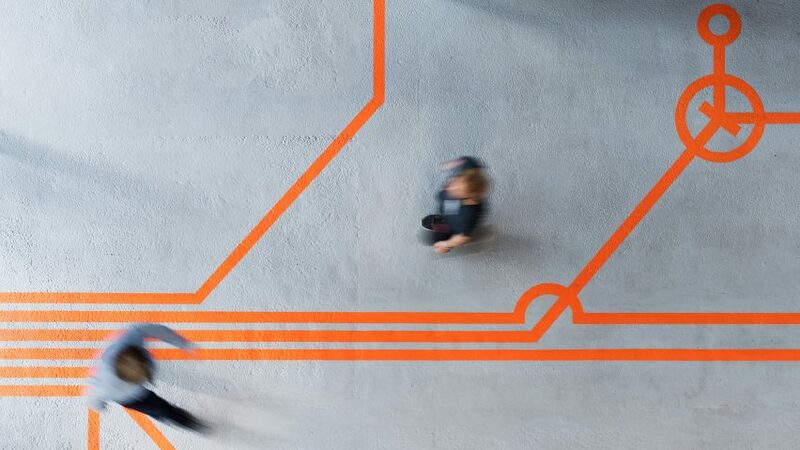 Studio dn&co's wayfinding for London's Here East campus features symbols borrowed from circuit drawings. dn&co was tasked with designing both interior and exterior wayfinding for Here East, a technology hub in Hackney Wick that is part of the redeveloping Queen Elizabeth Olympic Park. Inside the building, large bright orange graphics placed on the walls and floors guide visitors to different areas. 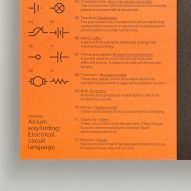 The signage uses lines and symbols based on those found in electronic diagrams. The emblem for a transistor is turned into an icon for the reception desk, while the zigzag resister symbol represents doors. As in a circuit diagram, the symbols are connected by lines – forming a giant floor graphic that connects different elements of the building. "Wayfinding is a functional necessity, but we saw an opportunity to create a memorable experience for the thousands of people who will interact with this environment," said dn&co creative director Patrick Eley. "The internal wayfinding accepts that a visitor may spend a little longer lingering in reception, allowing them a moment to engage and enjoy the iconography imbued with whimsical hidden meaning." 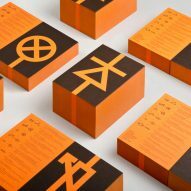 The design is intended as a reference to the technology organisations inhabiting Here East, which describes itself as "London's home for making". Visitors curious about what each of the 20 symbols mean can pick up a postcard at reception as a guide. 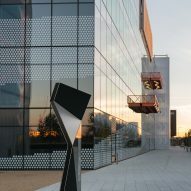 The studio also designed exterior wayfinding for the 111,000-square-metre campus, creating three-metre-tall "bent monoliths" with a faceted aluminium surface. 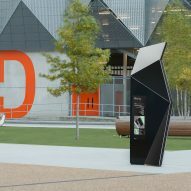 Each totem has embedded screens with interactive maps and graphics that can be set to show messages and animations, developed by digital agency Poke. 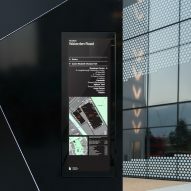 Other recent projects to take an innovative approach to wayfinding include Giles Miller Studio's glass tile billboards, designed to guide visitors through Clerkenwell Design Week, and a fragmented sequence of black and white signage panels that formed an optical illusion in an Amsterdam design shop.